It's that time of the year and it looks like an event-filled festival March 22-24. I did not know Othello supported a big flock of SHC. Just last week I accidentally discovered another big flock outside Willcox, Arizona. Thought they were geese from afar...but that call of theirs is distinct. This one is called Wings Over Willcox. (The town needs something!) 30,000 approx. move from interstate to deep playa(?) every night. we have had a couple of returning shc in the valley. not much to look at for color compared to the geese and ducks. Back when I lived in Tri-Cities, an enormous flock of sandhill cranes would fly over my house every spring, generally quite late in the day when I was home. The whole neighborhood would emerge outside to see and listen! I suspect it was Othello-bound. They don't stay in Othello, but it's a resting spot for them in their northward journey. Thanks for the reminder RichP. I lived in the Albuquerque area years ago and always loved taking my wife and family to Bosque Del Apache nearby to see the sandhill cranes and snow geese. Great memories. We saw them at Othello a couple of years ago and I hope to see them again this year. The festival was great! Many lectures over a broad range of topics and tours to different areas. I took an organized bus tour and attended a lecture on the natural history of the Blue Mtns as well as seeing a film on the Blues. 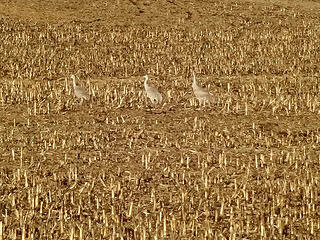 I also did a 27-mile bike ride which was organized by the festival and saw numerous cranes, snow geese and other birds. 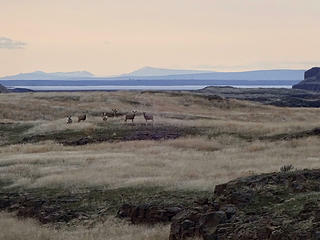 We camped two nights at Potholes State Park and I even got in some hiking in The Columbia National Wildlife Refuge. The festival is well organized and lots of fun. too many things going on! looks like you and family enjoyed the festival! next year, ha!